First of all, I was born on Christmas Day! And, secondly, my name is Carol. Do you get it? Sometimes I have to explain that to my students, but then they think it is amazing and it is - Christmas Carol! Know what else is amazing - Christmas in the classroom. And I have some truly spectacular STEM events to share with you to make this season magical in your classroom. Okay, that's seven things to share- Read on! You know this is my favorite- STEM is the reason I moved from a regular classroom and became a specialist, so these projects are always just fascinating. I have three main challenges that we complete every year- in different grade levels. I do follow a yearly plan and try not to repeat challenges between grades. For Christmas, we have Sleighs and Ramps, Cookie Packages, and Brown Bag Trees. This one proved to be so much fun and the kids loved tackling those ramps. TIP: We used foam board for our ramps. I purchase foam board sheets at Dollar Tree! The same size sheet at other stores is 3 times as much. Cut the sheet in half or thirds and it's a perfect ramp. This is one my third graders absolutely were intrigued by. Well, the word 'cookie' probably had a lot to do with that! TIP: The cookies I use for this challenge are butter cookies. I buy several bags of these at Dollar Tree (again, it's $1). 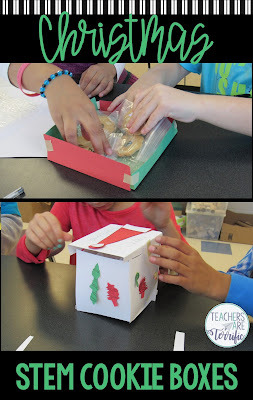 These are the perfect cookie for this challenge because they do break easily, so the kids must be diligent in protecting their cookie boxes. They are also delicious! I love this one and the materials are just too easy. One of the big items is just a brown paper lunch sack. TIP: You will need craft items to use as decorations. I grab Christmas related items at the Dollar Tree. However, I have also found that students will create their own decorations using just construction paper. Those three challenges are the ones we have been doing in December for a few years and the kids look forward to the one their grade level will be doing. This year I added a new activity to the STEM Lab! Oh, how excited my big kids were when they saw this one on our agenda! I tried it with 4th and 5th graders and we loved every minute of it. The tasks include solving math problems, completing a maze, and completing a word search puzzle. Our favorite part of this one was, hands-down, the Letter Wheel! TIP: This Escape Room does involve some advance preparation. The Letter Wheels have to be made for each group- but it's just copying, laminating, and cutting out. The tasks for students are all just pages that need to be copied. Just plan ahead! And there is more! This Escape Room also has an extension which is a STEM Challenge. Have you ever tried a zip line in your class? I promise, kids will have so much fun. Mine love watching their own devices zip down the line and the sharing of all the devices is a big deal. We gather around and let groups share their structure and attach it to the line, and then we cheer when it makes it to the bottom. I have several versions of zip lines and this new one is a Toy Sleigh. The students have to make a sleigh to hold toys and it has to look like a real sleigh with runners. They also have to design a way to attach it to the zip line- which is trickier than you think. My third graders tackled this one, but I also had older students try it (which breaks my rule of not repeating challenges between grade levels, but.. it was fun)! The older students built more elaborate sleighs and were able to attach them to the zip line easily. I did have to help the 3rd graders more. TIP: I have zip lines attached to the bolts that hold my white boards to the wall. We use these a few times each school year and I do not take the lines down. The lines are rolled up and taped to the wall. Also, you want lines made of a cord that will allow for smooth gliding. My lines are either fishing line or plastic cord. String does not work very well! Now, I know you hate to miss school days. I think teaching is the only profession for which being out sick is more work than being at your job. 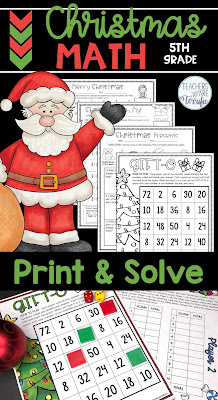 I can make your life a little easier with two levels of math resources made just for Christmas. These are perfect for days you might need to be absent and the only prep is to print the pages. 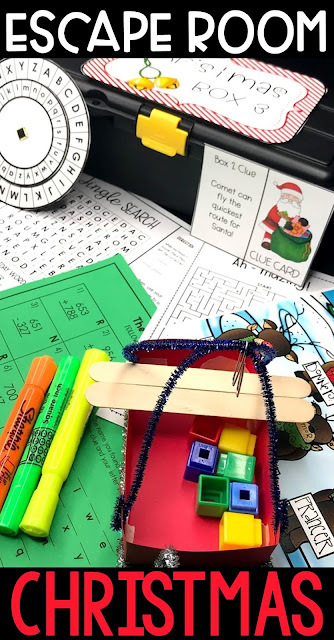 Each resource has games that kids can play that require only a pencil and a set of number cubes. 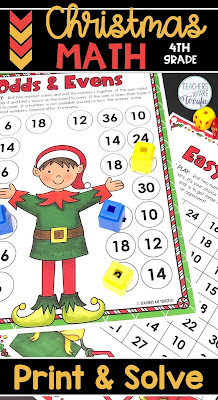 The games will work perfectly for your early finishers or in Math Centers. There you are, my friends, some fabulous ways to let me help you get through this busy holiday month. Which STEM Challenge will you try?